RealClearPolitics - HorseRaceBlog - Is PA-12 a Bellwether? Will Money Save the Democrats? Is the Economy Obama's Only Problem? What Went Wrong with Obama? What's So Bad about the JournoList? All the evidence pointing to monster Republican House gains this fall--the Scott Brown upset win in Massachusetts, the scary polling numbers in once-safely Democratic districts, the ever-rising number of Democratic seats thought to be in jeopardy--was contradicted Tuesday. In the only House race that really mattered to both parties--the special election to replace the late Democratic Rep. John Murtha in Pennsylvania's 12th District--Republicans failed spectacularly, losing on a level playing field where, in this favorable environment, they should have run roughshod over the opposition. Martin and Mahtesian make some valid points, but they are massively overstating their case. The details of last night's special election don't support the bellwether argument as these two have constructed it. Let's begin with the political demography of the district. In 2004, George W. Bush won 255 congressional districts. PA-12 was not one of them. From 1994 to 2006, the Republicans held the United States House of Representatives, controlling as many as 232 seats. PA-12 was never one of them. In fact, the Republican-dominated Pennsylvania legislature created a heavily Democratic 12th district in 2002 by moving conservative voters around to generate the Republican-leaning 18th district (currently held by Republican Tim Murphy). Like many districts in this region, PA-12 went strongly against Barack Obama in the 2008 Democratic primary. 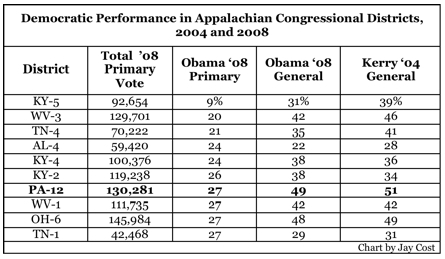 The following chart has the details on Obama's 10 worst Appalachian districts. There's PA-12 in the #7 spot. Obama pulled in just 27% of the vote during the primary. Two features stand out from this chart. First, PA-12 had the second-highest number of primary participants, behind only OH-6. This is important because the Pennsylvania presidential primary was closed; one had to be a registered Democrat to vote. This means that there are a lot of Democrats in PA-12. These Democrats are pretty well unionized. After all, this is the district that includes a place named Uniontown! Unionized Democrats in a special election are a force to be reckoned with, to say the least. Second, even though they did not particularly care for Obama when he faced off against Hillary Clinton, the residents of PA-12 swung behind him reasonably well in the general election. Obama did better in the PA-12 general than he did in any of these other districts. This means that these self-identified Democrats still actually vote Democratic there. That's in contrast to states like Kentucky and West Virginia, where people who call themselves Democrats have been behaving like Republicans in the last 15 years. This is a hugely important point to bear in mind. My back-of-the-envelope calculation of the party turnout in last night's election indicates that a whopping 62% of the voters were Democratic, just 34% Republican, and a measly 4% were Independent or had a third party affiliation. If you give Republican Burns 90% of the Republican vote and 60% of the Independent vote, that means Burns won about one in five Democrats. That's a very decent haul, but it is just not enough in a district where there are so many Democrats coming out to vote. And let's not forget the Pennsylvania Senate primary. As I watched Sestak rise in the polls, and saw the flood of Senate primary advertising here in Western Pennsylvania, I knew that Mark Critz - the Democratic candidate in PA-12 - was being helped. The Sestak-Specter contest was driving up interest, and both candidates were putting out pro-Democratic messages. Both factors were good for Critz. It's difficult to quantify, but this purchased him some votes. So, we had a political-demographic tilt of this district toward the Democrats that was enhanced by the high-profile Senate race and a presumably substantial union GOTV effort. We also had what amounted to two anti-Obama candidates in the race. If you didn't know that Mark Critz was a Democrat, his advertising would not have clarified matters for you. He ran as a pro-gun, pro-life, anti-health care reform, anti-cap-and-trade Democrat - or, as the lefty blogosphere likes to call them, a reviled "ConservaDem." Basically, he ran as a Truman Democrat, not as an Obama/Pelosi Democrat. What's more, the DCCC spent thousands on advertising that blasted Republican Tim Burns for his "support" of the Fair Tax, an idea that only the Democratic leadership is seriously considering at the moment. Most Democratic incumbents are standing for reelection, which means they will have to defend their voting records. Critz was not so burdened. I appreciate that Democrats want to breathe a sigh of relief because of last night. And they should, to some extent. The fact that the GOP did not win this special election is evidence that 2010 is not going to be some 1938-style tsunami where the majority party sheds 90 seats. If the Massachusetts Senate race tantalized Republicans with the idea of boundless political opportunities, the PA-12 special election should remind them to keep their imaginations in check. But Martin and Mahtesian need a reality check, too. They are arguing way beyond the facts to suggest that the district had a "level playing field," that it "couldn't have been more primed for a Republican victory," and that "the outcome casts serious doubt on the idea that the Democratic House majority is in jeopardy." Still, Republicans should be disappointed. I wrote recently that Republicans need to do well in Appalachian and Ohio River Valley districts to win in November. To do that, they must rebrand local Democrats as members of the Obama-Pelosi version of the Democratic Party. They didn't do a very good job of executing this strategy in PA-12, and they need to learn from their mistakes as they go on to compete in districts whose macro features are more favorable to them. Yet that doesn't change the bottom line, which is this. The political demographics, the effect of the Senate primary, and the anti-Obama/Pelosi tone of the Democratic candidate were all uniquely favorable to the Democrats last night. Control of the House of Representatives is going to turn on districts that are much less Democratic than PA-12, on a day when the net effect of television advertising is not so heavily tilted toward the Democratic Party, and on the fate of incumbent Democrats who cannot so easily hide from their national leaders. And let's not forget the view from 30,000 feet. Last night we saw two Democratic incumbent senators - Blanche Lincoln and Arlen Specter - mired in the mid-40s in their primaries. In PA-12, we find a candidate who positioned himself as an old time Democrat winning 53% of the vote in a union district where 62% of the voters were registered Democrats. How does this "contradict" "all the evidence" of a very good Republican year?